Friends and families mingled with residents and the local community at Wentworth Court’s autumn fete on Saturday 12 September. Cheltenham’s first dementia-only nursing home on Village Road opened its doors for an afternoon of family-friendly fun attended by over 100 people. Nearly £450 was raised from a prize raffle, a home-made cake sale and a bric-a-brac stall while children enjoyed petting miniature Sheltland ponies provided by Catherine’s Carriages. 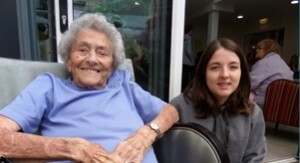 Activities Coordinator Suzanne Meadows said: “We had a great day with lots of positive feedback about our lovely home, the friendly staff and beautiful home-made cakes.